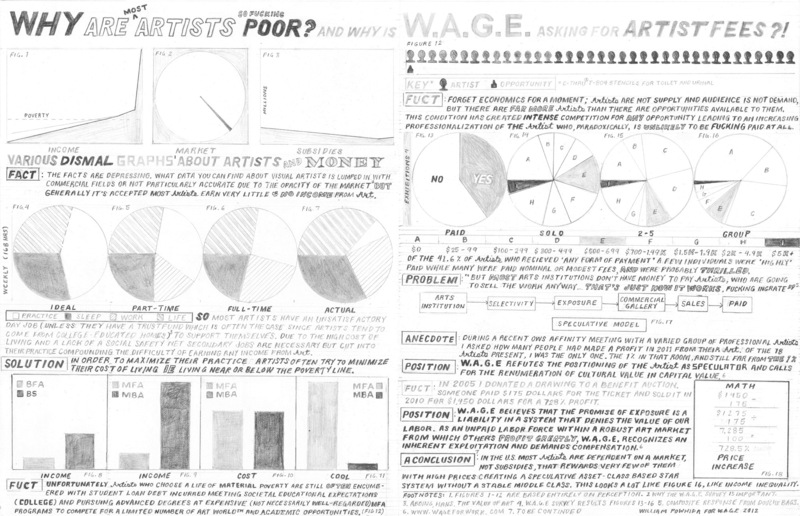 WILLIAM POWHIDA → Why Are Artists Poor? 58% of artists who exhibited at a New York non-profit organization between 2005 and 2010 received no form of payment, compensation or reimbursement – including the coverage of any expenses. As part of the W.A.G.E. / Artists Space Research Partnership, Working Artists and the Greater Economy will release the 2010 W.A.G.E. Survey results and present their analysis. This survey gathered information from nearly 1000 visual and performing artists about their economic experiences working with non-profit arts organizations and museums in New York City between 2005-2010, and included specific questions about the receipt of artist fees as well as the coverage of expenses for exhibitions, screenings, lectures and performances at over 67 institutions throughout the 5 boroughs. The survey results present a vital and precise portrait of the predominant economic relationships between artists and institutions. W.A.G.E.’s Research Partnership with Artists Space is based in part on the need to compare such information with the particularities of institutional budgets. Accompanied by Alison Gerber, sociologist and PhD candidate at Yale’s Center for Cultural Sociology, W.A.G.E. will provide a visual presentation of the survey results, followed by a specific comparison of Artists Space’s honoraria payments to artists, speakers and performers between 2005 and 2010, to the existing fee schedule set by CARFAC (Canadian Artists Representation/Front Des Artistes Canadiens). This presentation will also introduce the principles of W.A.G.E. Certification, and the work being done to develop it through the Research Partnership. Free food by FEAST/Brooklyn and survey posters with artwork by William Powhida will be provided. Survey graphics designed by Common Space.